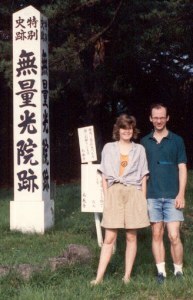 Lesley Downer wrote On The Narrow Road to the Deep North -- Journey to a Lost Japan in 1989. I naturally read it, since Patricia and I travelled parts of the same route in 1985 (or was it 1984?) on our first journey together.. We did it for the same reason -- to follow the path of the haiku poet Basho, who wrote a book of the same name (Oku no Hosomichi) that is one of the jewels of Japanese literature. Run right out and buy the Penguin edition if you do not already have it. We went by train: Ms Downer did the whole route on foot. Someday Patricia and I will go back to Yamadera (famous poem about cicadas) where we camped and P bathed in the river (! ), and Hiraizumi (famous poem about summer grasses) where we partied with the whole town under paper lanterns. We nearly went last fall, with the children and some friends, but enjoyed the abundant charms of the hot springs at nearby Hanamaki instead. Downer also wrote a very interesting book about the Seibu business empire (The Brothers ) -- she writes for the Economist and the Wall Street Journal (say the dust jackets). So when I saw that she was going to lecture at the British Museum about her latest work Madame Sadayakko I bought tickets and a copy of the book. Patricia had me read Memoirs of a Geisha against my normal inclination (not interested in Geisha). I felt it was ok, but would have been improved by being true. The story of Sadayakko is true, and stranger than fiction. The twelfth child of an impoverished samurai family, she was sold off to be a geisha. Beautiful and charismatic, she grew so popular that prime minister Ito eventually bought the (very expensive) right to deflower her when she was fifteen (he was 45). That was in 1886. He held on to her exclusively for a few years, then she moved on to other patrons and lovers, the former usually bankers, the latter generally sumo wrestlers or actors. Eventually she married an ebullient comedian named Otojiro. At the lecture we got to hear part of his famous satirical song, probably the first recording of any Japanese singer. It has the astonishing refrain: "Oppekepe, oppekepeppo, peppoppo". Trying to build a theater, among other enterprises, he quickly squandered the wealth that Sada had amassed. At one point, partly to escape creditors, the two made a crazy sailing trip to Kobe during the stormy season. After that, Otojiro decided to take his acting troupe on a world tour. In San Francisco, their savvy local agent advertised with Sada's face, even though the troupe normally would not have any female members. She was a critical success, but they seem to have lost most of their money and nearly starved. In Chicago they could get no one to offer them a theater, until finally one manager's daughter insisted they be given one matinee, since she was Japanese-mad. This was the height of the Japanoiserie period. They were a wild success, though tottering on their feet. Fattened up, they moved on to Boston (with a stop at Grand Rapids -- hi mom! ), where they were a huge success. Sadly one member died there from his own face-paint: chronic lead-poisoning. What is the secret of Sarah [Bernhardt]'s appeal to us? Why do our hearts go out to Sada Yacco? Why is Rejane [ celebrated French actress] enchanting? If I, Paris-like, were called on to decide which of these three goddesses was most admirable, the apple would (I think) be adjudicated to Sada Yacco. Whew! They went on to dine with the Tsar, and be chased by Puccini around Italy. Downer ended her lecture at this point, apparently in an odd attempt to get us to buy the book, or perhaps not to give everything else away. Of course most of it came out in questions: the return to Japan, putting on Shakespeare in Japanese, with Hamlet bicycling in on the hanamichi. She did not mention Otojiro's death, and another very romantic/tragic subplot that went on in her later years. Sada founded her own temple, which one can go see. I had better admit that the writing is not perfect. "Did she think this was original?" asked Patricia, reading in the first few pages the lines "eyes dark as pools and deep enough for a man to drown himself in." Downer also makes feminist points, valid enough, but over and over. She mentions with inexplicable frequency that one of Sada's eyes looked western, the other eastern. Patricia's and my weekly dates are usually movies in the suburbs, so the lecture made a great change. I marvelled at a whole auditorium full of people who would presumably not be bored by interminable talk about Japan. Ms Downer looked rather nice in a leather skirt and Issey Miyake pleated top (P sneered at the shoulder pads). Mr Miyake is mentioned in the book, helping with textile history. I had brought a bag of Downer's books to be signed -- first time I have been to a signing -- and gushed a bit. She saw the two 1st eds (UK/US) of "The Narrow Road" and said "You don't see these around much any more," adding that it was still her favorite. She signed it "To Erich and Patricia, thanks for reading my books", then paused and said, "Gosh, that sounds kind of pathetic, doesn't it?" Laurie wrote: loved this review. made me want to buy the book as well as see more of you & P! David wrote: Finally, read your review of Lesley's geisha book (which I still haven't read) and felt like she was right in front of me. We had a few breakfasts together in Tokyo a few years ago and she set me up for the Yamadera pilgrimage. Glad you liked her lecture and that she filled the hall. Maureen wrote: Have you read Geisha : A Life by Mineko Iwasaki? It is an excellent read.